I grew up with a mother who saved plastic containers and bottles to reuse and re-purpose, so I became a person who also saves bottles and jars to reuse and re-purpose. But, then I found out that the store-bought water bottles are not only bad for the environment, they can leach chemicals the more you re-use them. And plastic bottles bond with oils and fats, so they're not good for re-using, either. Today, I have a few bottles to share with you that I've been loving for my bottle needs! 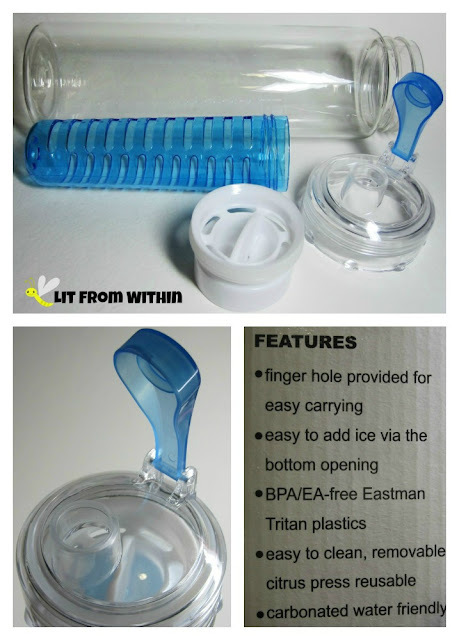 A few weeks ago, I shared with you my review for a Tritan plastic fruit-infuser water bottle - and I liked it. But, it has a screw-top, and that doesn't always work for me, especially when I have wet nails! This bottle from Fruitissimo has a flip-top! If you haven't tried infusing your water, you're missing out! By putting fresh fruit and veggies into the water, the flavor and vitamins leach out into the water all day long. My favorite is cucumber water. I tried pomegranate arils, but... nope. luckily, this bottle also comes with some recipes! I was afraid that the flip-top would leak, but it didn't. I held it upside down, shook it - nothing. It has a good seal, and yet, I can lift the top with a finger and drink easily through the spout. I wish the basket was a little longer, but that does mean that there's room for some ice - or, you can freeze your fruit first, and it'll keep the water colder, longer. Without the basket, it's still a great water bottle - it holds 28 oz of liquid, and is reusable, recyclable, and can be used with carbonated water, too. The pretty blue slotted basket inspired this negative-space nailart! I used SephoraX Picturesque and striping tape to create this look. For more information, or to purchase, this Fruitissimo Sports Water Bottle can be found on Amazon, where it retails for $12.99. 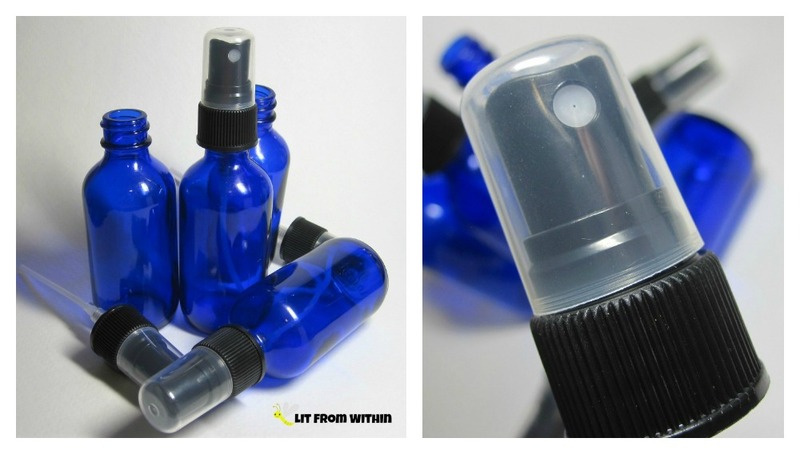 Now that I'm hydrated on the inside, when I want to create my own scented oils for keeping my skin hydrated, I'm loving these little cobalt blue glass spray bottles! These bottles from Cornucopia Brands have a fine mist sprayer that is great for DIY room sprays, perfumes, facial toners, or even oil blends for the hair or body. If you're into DIY, or even if you just want to decant larger bottles into something smaller for easier use, these 2oz bottles would work well. The cobalt color can help protect the contents from light, and the spray dispenser protects from contamination, so your products stay fresher, longer. A little spray-inspired nailart! The base is Sation Paint Some Sugar On Me, a dark blue crelly with silver shimmer. I then added some 'spray' with a silver nail art glitter striper, and a clear rhinestone. These spray bottles are sold in a 4-pack on Amazon for $7.99. For even more spray-bottle goodness, check out these 8 oz glass bottles from Cornucopia Brands! I recently got a bottle of shimmer body oil, but it came in a flip-top dispenser that made it difficult for me to use. With a spray bottle, I can get a even, light layer of the oil all over my body - even in areas that are harder for me to reach. And, this way, I don't get clumps of glitter in any one spot - the spray mist is fine enough to dispense just a little of the shimmer for a flattering glow. 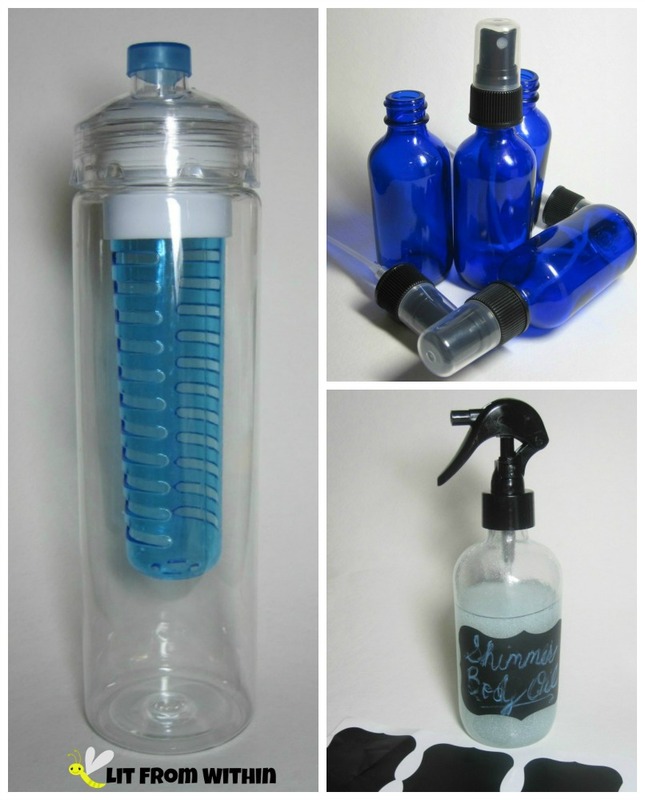 This set comes with 2 heavy-duty glass bottles, 2 sprayers, and 4 chalkboard labels that can be reused over and over. Because the bottles are glass, they can be washed and re-used for a multitude of things: mix a little oil and vinegar together for a quick salad dressing, or just use oil for making your own DIY pan spray. Mix water and peppermint oil and use these bottles to spritz windows and baseboards to keep spiders and bugs at bay. 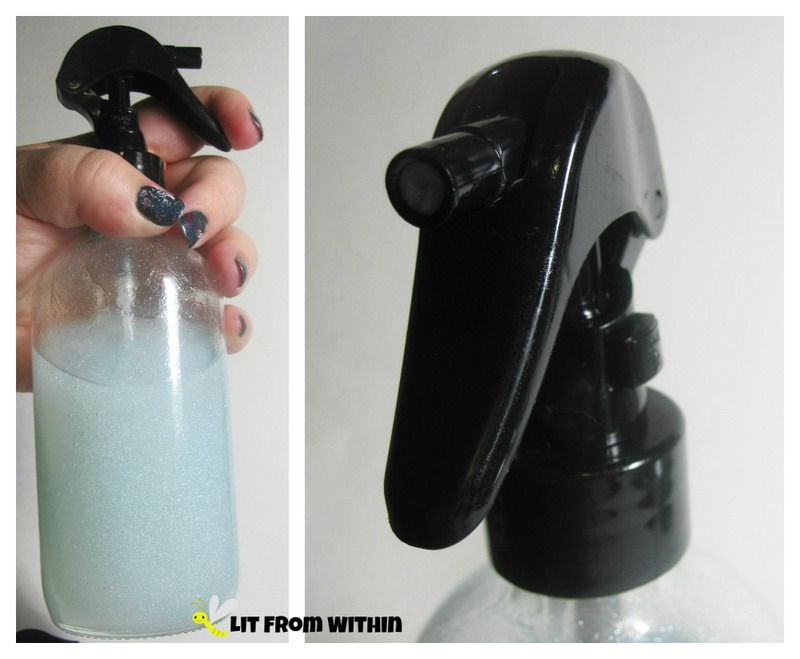 These bottles would be great for DIY cleaning solutions, too, because they are small and easy to hold. The sprayers can be set to either mist or stream, too. This set of 2 8oz glass bottle sprayers retails for $11.09 on Amazon. Do you like to make your own infused waters or DIY cleaners or essential oils? What kinds of bottles do you use?